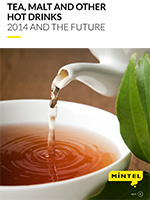 This global annual market overview will provide you with an in-depth review of the key issues in the global tea, malt and other hot beverages market through 2014 as well as our forecast for what will happen in 2015 and beyond. The tea category is facing strong growth opportunities in many developing markets yet sees slowing growth in some developed markets. Tea brands can benefit from the shift from modern retail trade and subsequent demand for packaged tea products in developing markets, while in developed markets premiumisation is contributing to value growth. Investments by Starbucks, Unilever, Gruppo Illy and smaller players such as Davids Tea and Kusmi Tea in expansion of retail tea stores and cafés indicates tea will have an increased presence in high streets and shopping malls going forward challenging coffee and other beverages in the out-of-home consumption occasion. Asia continues to be a hub of innovation for RTD tea. The region is seeing increased innovation in healthier and low sugar varieties as well as interesting launches that incorporate traditional Chinese medicine (TCM) ingredients and offer functional benefits. In other regions, RTD tea is well positioned as a health alternative to fruit juice and CSDs as evidenced by a growth in launches of premium and low sugar varieties.